Yesterday I was transcribing some more pub inventories. Each of the small notebooks that make up this collection of Inventories and Valuations [A/94/B/LI/ ] in Barnsley Archives contain a number of entries. Although I have ordered up ten notebooks which date from 1829 to 1855 by individual entry where a pub's name was listed in the catalogue, I am discovering that there can be more than one inventory of interest to me in each notebook. The first notebook I examined [A/94/B/LI/20] contained the inventories for the Coach & Horses and the Turf Tavern that I wrote about last week, plus yesterday I found a entry for the Freedom Inn further on in the book. At this rate the ten notebooks I have ordered will take me four months to examine if I only transcribe two inventories each week. That's taking us into the New Year - scary thought! The inventory for the Freedom Inn was another of those which was taken as the pub changed hands, again in 1844. This names given were Matthew Sykes and Richard Hattersley. The address of the pub was not given in the notebook so I Googled it in an attempt to locate it. Mysteriously the above extract relating events in 1837 refers to the Freedom Inn as belonging to Joseph Crabtree, a "key local leader" in the Chartist Movement. It also refers to Dog Lane, Barnsley - but that is not where I found the pub. In a trade directory in the Archives I found a reference to the Freedom Inn being on Wilson Street, a fact confirmed by another Google hit, this time from Howse, G (2007) Foul Deeds and Suspicious Deaths in and Around Barnsley, which mentions an attack on a police constable in the pub in 1864. The men accused were called William Flowers and William Hill. What an odd coincidence that both mentions of the pub include a man called William Hill - presumably a very common name in Barnsley! Joseph Crabtree was one of the men who signed the Barnsley Manifesto in June 1838. He was imprisoned in Wakefield for attending an unlawful assembly at Barnsley in 1840. In a statement made to the inspector of prisons he says he was a radical before he was a Chartist, and that he was the local correspondent for the North Star (O'Connor's Chartist newspaper mentioned in the clipping above) for one year for which he received £10. He stated that he, "thought there was a power in the people to right themselves without interfering in the rights of others". His occupation in the prison records is Linen Weaver, although it also states that he had been supporting himself by keeping a shop selling clothes - this doesn't sound like a landlord of a pub. From 1830, when the Beerhouse Act was enacted, restrictions on the sale of beer and brewing were reduced and anyone could buy a licence for just two guineas. A weaver could earn £1 a week in Barnsley in those days, so this wasn't an outrageous amount. Hundreds of small beerhouses opened all over the country often in very small premises. The 1841 census shows a Matthew Sykes living on Wilson Street. He is not listed as a publican, rather as a Linen Bleacher. This is fairly normal for small public houses, the man would have another job and his wife would run the pub and do the brewing. Despite the transfer in 1844 to a Richard Hattersley by 1851 the pub is occupied by Joseph Mitchell who gives his occupation as Innkeeper. This is also the gentleman I saw referred to in the trade directories. Maybe Richard Hattersley bought the pub as an investment and let it to Mitchell. We'll have to see if another inventory of transfer turns up. 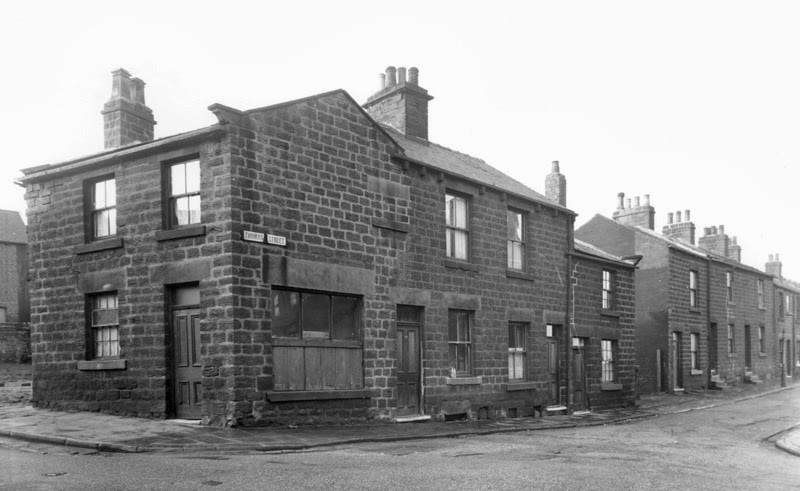 Wilson Street was in Wilson Piece - an old crowded part of Barnsley where the houses date back to the late 18th century and the heyday of the Linen trade in Barnsley. I have written more about it in previous blog post. By the 1840s the area had become dirty and overcrowded as the weavers' incomes declined and their living conditions followed suit. I have found no pictures of the Freedom Inn, but I imagine it was a stone built pub, similar to the houses around about. The picture above shows a corner shop with a Thomas Street sign above the window and is captioned 77-87 Thomas Street on the Yococo website. The Freedom Inn was a relatively large building, suitable for meetings. In the two map snips I have included you can see it is easily twice or three times the size of the houses near by. Some later terraces of houses on the edges of Wilson's Piece are named after political personages and can be seen clearly on the large scale 1889 map of the area; Cobden Terrace and Bright Terrace for example, after the Anti-Corn Law Activists of the 1830s. It sounds like political activism had a popular following in Barnsley throughout the early 19th century and Wilson's Piece, despite or maybe because of its poverty, was a hotbed of radicals!